Propping him on the wall, he was waiting for probably his last client of the day. It was a long day and he was tedious, all he was wishing was to curl up on the bed. As the negative thoughts were weakening him, the client appeared. He, exhausted, made an enthusiastic face, something the client was expecting, a professional consultant. It was his 18th client of the day. He has a diary full of clients, a long list of people waiting for his consultancy, yet he wished more. No matter, how long that list becomes, he always finds it short. He felt something was missing and that something will always be missing. That something is the success. No matter how hard you try to work, how hard you pursue, that something will always be missing. The problem is, each time you will achieve a goal, the goalpost will immediately be reset for something more, something bigger than what you have achieved. Let me give you an example to support my argument. Life is like a song, Dance on it. The Philosopher Allan Watts has said," Life is a song and the sole purpose of a song is to dance." Mercy Torres, a long time entrepreneur became a mother at 18. By 22, her only dream was to achieve success in life, to prove herself to the world. But she was unsure of what she was trying to justify. By 23, she became a mother of two daughters, doing a low wage job. She has a loving husband, two beautiful daughters but still, she felt uncompleted. She strongly wished to achieve success, a kind of success that can only be achieved by material possessions, wealth. By that time, the song of her life played but she didn't dance. By 29, she has a master degree and was doing a high wage job. She was surely heading towards the success defined by her. Later, she became a government contractor. She worked harder and harder every day. She knew if she kept working like that, the success will surely be her. Finally, by 40, she has finally achieved the success defined by her. She has a big house, number of cars, a big bank balance. She has her own office at an ideal place. She can now dance in her life. Really! First, the kind of life she has landed her into doesn't allow her to dance. She never has thoughts of dancing. She has completely forgotten to dance. What she dreams now is a big company, instead of her small office. And if she achieved the next level of success, the goalpost will immediately be reset to making her company, the most profitable of the world. Second, say if she decided to dance at the 40s, the half of the song has already been played. The problem is, unlike other songs, the song of the life gets played only once. She has already missed dancing on more than half of the song. Her children have grown up. She remembers the time she has to left her weeping daughters, to perform extra night shift. She can argue, all she is doing for the betterment of her daughters. But that's not something her daughters wish. They wish to dance with her on the song of the life. But the time has passed, the song has been played. Her daughters cannot be children again. She only has an option to dance on the rest of the song. 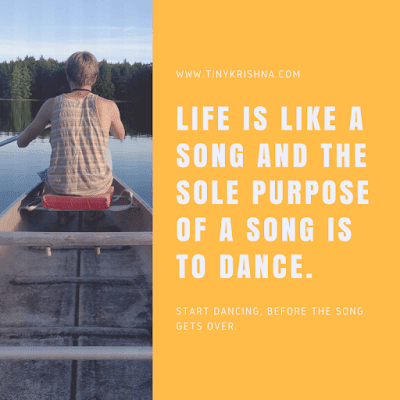 But the tragedy is, when most people realize to dance, the song is about to end and few unlucky ones never realize to dance. Dancing doesn't mean to quit your jobs and performing unlawful activities. It is to enjoy whatever you have, start enjoying your life. Work enough to fulfill your needs. Don't go mad for success, start dancing on the song of your life.